Academia Nacional de Tango is the only institution of it’s kind, dedicated to Tango. Founded by poet and twice Nobel Prize nominee for Literature, Horacio Ferrer. Ferrer presided over the Academy for over 20 years until his recent passing, a great loss that the entire genre will continue to feel, but he leaves to us among many of his important legacies, the Academy, which is the sixteenth in the history of National Academies in Argentina, (made official on June 28, 1990, by Decree 1235 of the National Executive power and is part of the Ministry of Education and the Secretariat of National Culture of Argentina). The reasons for the creation of the Academy, briefly put, are that Tango, as musical, choreographic, poetic and interpretive art form, encompasses a century of inalterable validity, as authentic and profound expression of the Argentine people and as such this artistic patrimony must be compiled, arranged, studied and professionalized and thus saved from any possibility of loss or destruction, this goal being true in Argentina and world-wide. 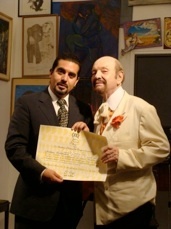 In 2007 in a unanimous vote of the Directive Council, Leonardo Suarez Paz was appointed Académico Correspondiente or Academic Representative from the Academia Nacional del Tango of Buenos Aires. As such he conducts lectures and courses in New York and the United States and works on cross-cultural programs and collaborations. Those desiring to participate in classes or to conduct events in collaboration with the Academia in New York, should contact Leonardo Suarez Paz. The education at the Acamedia includes Academic Seminars, Plenary Session, the ‘Liceo Superior del Tango,’ which offers extensive courses, Conservatory of the Styles "Argentino Galván," Patrimony Division (dedicated to study preservation and promotion of the genre), Fine Arts Exhibits, Courses of Tango Dance and Library. In addition the Academia has six publications, dedicated to tango. The Academy is home to a Library of Archives and a Museum, which is a passage through the history of Tango since the 1850’s until present day. It includes the Olympus of the Glory days, Homage to the creators of Tango, images and sounds of all the epochs with recitals in music, dance and singing and the museum store. “The Tango: from it’s present to it’s initial roots, it has been a century and a half of dreams, nights, encounters, corners and solitude, of apogee and of crisis. Ten generations have lived it’s stories and legends, it’s anecdotes, creating and appreciating it’s poems, songs, the jewels of orchestration, the artistry of it’s dancers.” H.F.